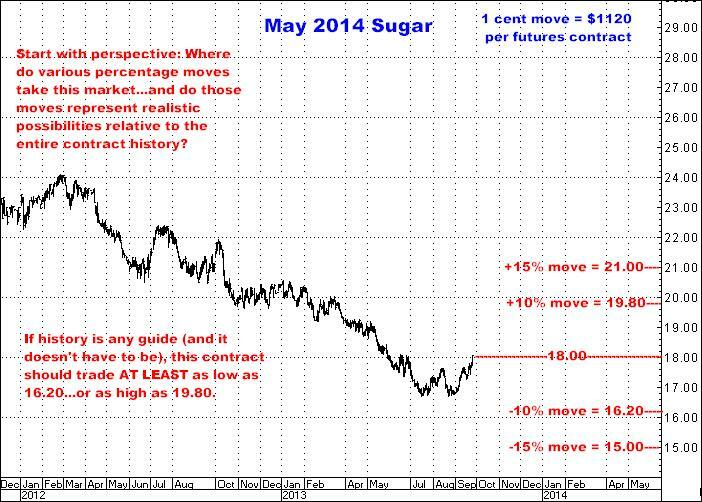 I will tell you right up front that I essentially know nothing about the Sugar market…at least in the sense of planting, harvesting, processing etc…but I have, like all the commodities we trade, watched it move for 33 years and do have some idea of what sort of potential can be there when it does start going somewhere. 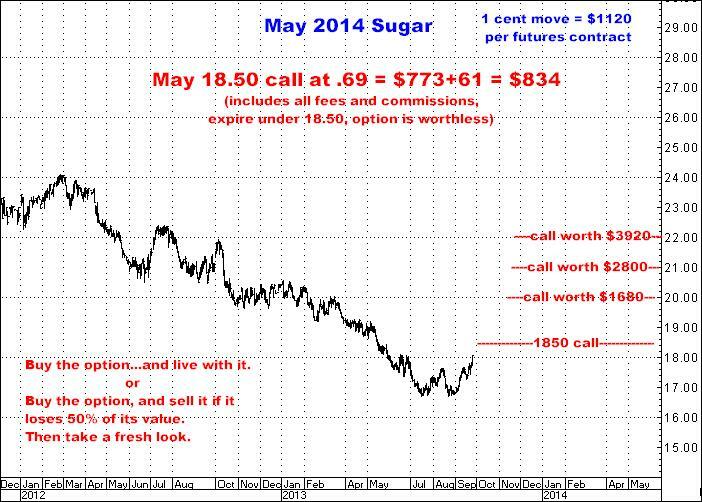 Having noted Sugar had done nothing but go down for several years, back in the spring I started thinking, “Must be a buy somewhere”, so I started keeping an eye on it…then watched it keep falling lower and lower…and lower…inducing me to become more and more interested in getting long at some point. However, at the same time I was thinking this market HAD to have a rally in it somewhere, I also was telling myself. “Don’t just go in and buy it while it is making new lows. WAIT for SOME sign of a turn. THEN get long”. I think that “sign” has finally taken place…And I AM NOW A BUYER, GOING OUT TO THE MAY 2014 CONTRACT. Here’s the big picture…Nothing complicated…It’s been dropping for several years. And the near term…and my feeling I needed some sign of an upturn? Obviously, just because I draw a few lines on the chart and say, “Maybe this is a bottom”, does not conclusively mean anything. But I do look at the two charts above and definitely suppose that we could EASILY have a 4-5 cent rally (or more, for sure) before May goes off the board seven months from now. One of my core beliefs is: What we are really trading is volatility. 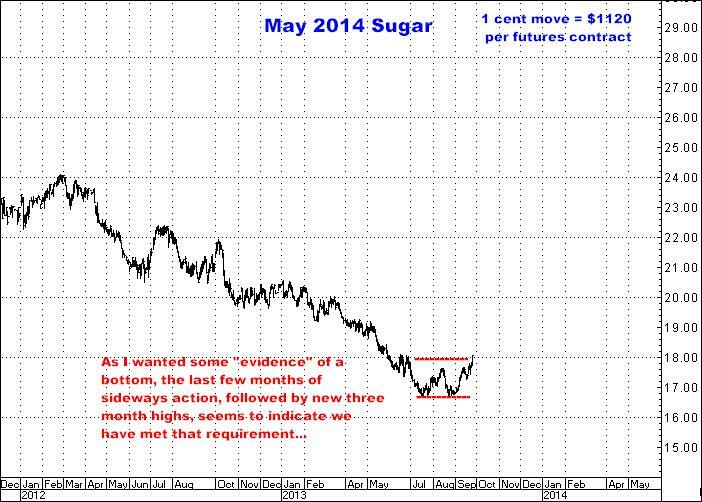 And with this in mind, I did some research on what sort of moves might be expected in Sugar between now and next May. Here are the results for the past 10 years…I have simply taken the May Sugar close on October 1, then observed how much above or below that close the market has traded before each yearly contract expired…which produced some very interesting numbers which can be observed on the table below…If the idea of going through this data line by line puts you to sleep, just note the figure highlighted in yellow. It’s really all that counts here…that is, DOES Sugar move? Which way? And by how much? During 7 years, the biggest move was down. The smallest of those being 10.5%. Most others were notably larger than that. During 3 years, the biggest move was up…interestingly, by large percentages…+53.5%, +51.0% and +71.0%. My own conclusion then becomes: Well, it does go somewhere. I think it is safe to expect, minimally, a 15% move one way or the other, with the obvious possibility it could be much more if on the upside…And just as obviously, I say this with the understanding the last 10 years may be meaningless. Nothing says it has to go anywhere at all. 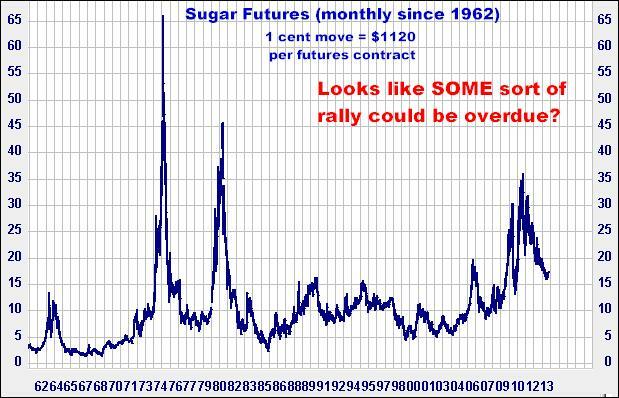 But with Sugar currently trading at 18 cents a pound, a 15% move would mean a move, AT LEAST, to either 21 cents or 15 cents. Or, if I am right, and we get a relatively modest 22% move, the $2894 will turn into $8400. And…if I have over 7 months for either of these two scenarios to play out? I THINK THIS IS ABOUT AS GOOD AS THE NUMBERS EVER GET…WHICH, IN THE END, IS WHAT THIS STUFF IS ALWAYS ABOUT…THE NUMBERS. In this GAME, why you make any trade is not nearly so important, I believe, as the “math” behind it all. Maybe I am dead wrong, but I think this is something of a lottery ticket trade, just with better odds? I mean, wouldn’t you suppose it’s GOT to make some sort of decent bull move at some time? 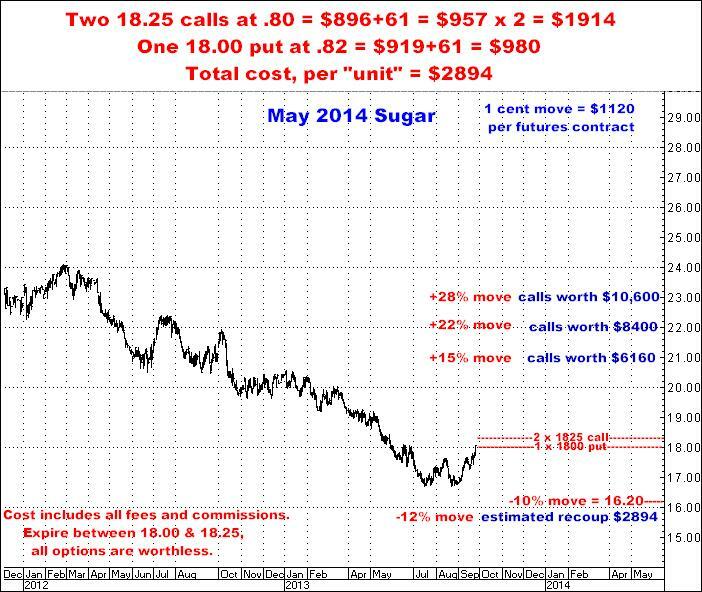 Again, to me, it does just all boil down to the math…what options cost and what they could be worth if Sugar moves 3, 4…or even 7 cents. Even though all of us would like to assume that research and intelligent thought processes are what lead to profits in the markets, the simple fact that MANY times the best research often does NOT lead to being right, which generally substantiates my belief that sometimes WHY you put on a trade doesn’t have to entail ANY sophisticated reasons whatsoever…beyond something like my view regarding Sugar right now, or, “I just think this is a good bet. I like the leverage. I like the numbers. I think this market is long overdue for a decent (maybe better than decent) rally”. And the next thing we also experience is the market being 2 or 3 bucks lower and a whole bunch of people wondering why they didn’t see it…when it was so “obvious” (in retrospect). I think I have seen 10 different analysts in the past few days citing “major support at $13.00 in Soybeans”. Beyond those immediate perceptions, I know they are out there but I can’t find anyone who is seriously bearish this market…All the talk is about “recently improved weather being too little, too late” to help the crop…or “the market hasn’t yet accounted for the damage already done”. Or “Farmers don’t have to sell at these prices”. Or “What if they have problems in South America”. 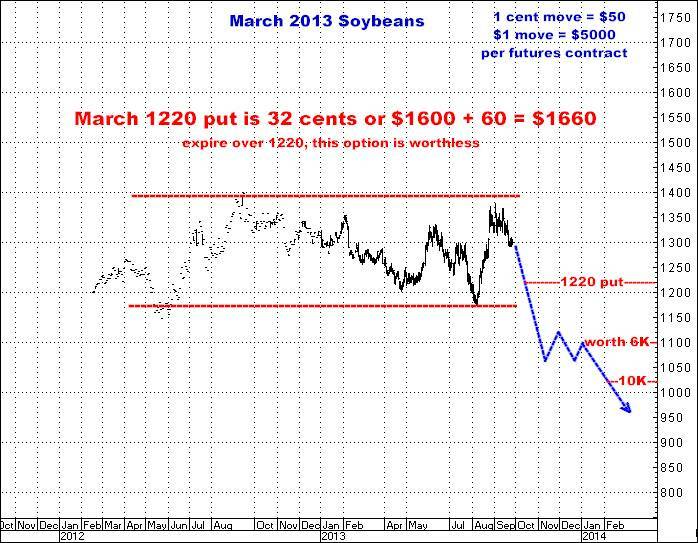 Or a whole bunch of other “What ifs?”, ALL skewed toward the idea that Soybeans are a buy. 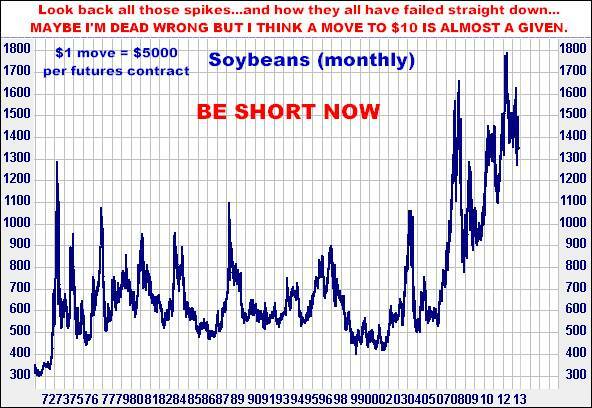 In a related vein, most recently (Sept 12), the USDA came out with a major report that was universally regarded as “extremely bullish” by all those same people who are still talking the upside…but the rally following the report has now been followed by a full $1.00 sell off into new several month lows…The point is, if Soybeans can’t go up, and stay up, when surprising VERY bullish (supposedly) news occurs, what IS going to make them go up? Especially now as we head into harvest with RECORD crops in the fields? I MAY BE DEAD, DEAD WRONG…BUT I PERSONALLY WANT TO BE AS SHORT SOYBEANS AS I POSSIBLY CAN…I DO THINK THERE IS A CLASSIC (BUT ACTUALLY “ROUTINE”) COLLAPSE COMING IN THE SOYBEAN COMPLEX. I SEE OWNING PUTS AS REPRESENTING TREMENDOUS LEVERAGE. I THINK WE ARE MINIMALLY HEADED FOR SUB $10.OO PRICES…AND A HECK OF LOT FASTER THAN ANY OF THOSE BULLISH ANALYSTS, FARMERS AND TRADERS WOULD EVER THINK POSSIBLE.